The low growing, spreading, airy texture of this thicket-forming deciduous shrub is a dominant element in many of our low to middle altitude woodlands. It is perhaps better known in winter for its round, ½ inch, white waxy berries. 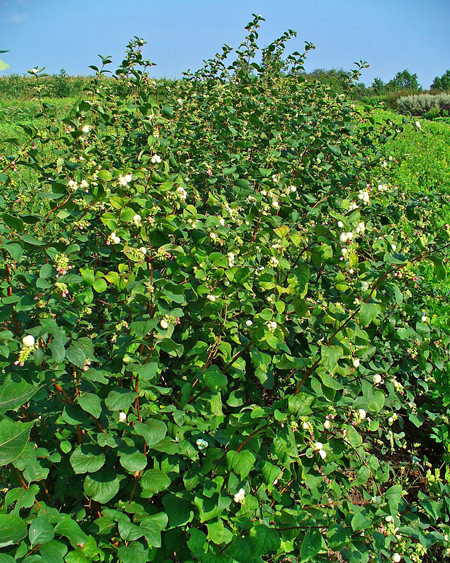 The berries are striking when snowberry is planted with native roses and their red hips. Growing to six feet tall, and spreading by its suckering roots, Snowberry is a valuable restoration and wildlife plant. Adaptable, it will grow in any fertile, reasonably well drained soil, in full sun or partial shade. Quite drought tolerant, it is also a good streamside plant, flourishing in partial shade or full sun. It is good for erosion control and woodland areas, but its round, green leaves and gentle appearance warrant its use in the landscape as well.